Even before the sun rose, we could hear the crazed sound of the crows that lived in the trees around Kawandgyi lake. Until you know what it was, you’d swear they were monkeys making those ‘ooo-ooo’ calls like what you hear on cartoons or movie sound effects. Looking out of the hotel window at the pre-dawn darkness, a squirrel ran across the tiles of the roof below, searching for it’s first snack for the day. Early nights make for early mornings so we were up and preparing for our trip. We headed down for our buffet breakfast, which was plentiful with a huge variety of food. J had mohinga that I tasted. Too fishy for my vegetarian taste buds, but very tasty. I also snuck a few pieces of the local-style semolina cake into my pocket for our journey. Out in the car park, our driver Kyaw (who had picked us up at the airport when we arrived) spotted us before we spotted him. Taking our bags and placing them in the boot, he asked how we slept and did we have enough breakfast. He then gave us a run down of the itinerary of the next five days, asking us to let him know if there was anything in particular we wanted to see and he could stop anywhere, anytime to take photos or have food etc. It was a few hours drive to Bago, with an hour of it in heavy traffic getting out of Yangon. Honestly, J and I were interested in anything and everything, so we told him to show us anywhere he thought was worth while, particularly local, less touristy places. One of my favourite things to do when travelling is simply watching local life go by. Perfect for hours in the back of a car. Traffic was solid all the way out, and we were pleased when we recognized the area around Inya lake and the airport. It was a slow crawl but we didn’t mind. So many little sights of day-to-day life to see along the way; workers waiting for busses; busses overflowing with passengers, construction workers swathed in cloth protecting themselves from both the sun and traffic fumes, and road-side sellers wondering down through the lines of traffic with newspapers and books. When one saw us in the back of the car, he quickly found a photocopied book in English to try to sell us. We waved him off with a smile. It took about an hour to get out of Yangon’s traffic congested roads. The shops and building gave way to rural towns and farmland. A few times along the way, we stopped to pay road tolls. Kyaw explained that how much you pay depends on how far down the road you are going. Along the way, we passed many golden payas, some seemingly in the middle of no-where. Sitting around them, white-skinned Buddha statues in maroon robes sat watch in peaceful contemplation. A few kilometres out from Bago, we came across the huge Kyaik Pun temple. Well, it isn’t your regular temple or stupa, Four enormous Buddhas sat back-to-back on a small hill gazing out over the land in each of the four directions of the compass. A few locals welcomed us with friendly smiles as we approached the covered entrance. From the temple platform, we could see a mass of blue-black clouds approaching quickly. By the time we walked around the Buddhas, the smell of rain filled the air. A few great cracks of lightening flashed across the sky followed by rumbling thunder. J tried to hurry me back to the car, but I could see the clouds were travelling in such a direction that it would miss us. I was determined to circle three times, and take my time examining these great figures. We were there for a good half hour, and bought some cold drinks from the local vendors. Surrounding the entrance were stalls, many closed up, others selling incense and candles. In tourist season, I’m sure there would have been numerous vendors all trying to sell trinkets and souvenirs to us visitors. We were pleased we had chosen to come at a quiet time of year. As we continued our journey, we become more and more happy with our decision as it become very evident just how much more commercial and crowded it must be in the cooler months between December and March. From there, we drove the short distance into Bago town, where Kyaw navigated through the narrow, shop-lined dirt streets to Shwe Tha Lyaung paya – one of the largest, most sacred, reclining Buddha temples in the state. Following us, that big thunderstorm loomed overhead. “No problem”, Kyaw chuckled, promising us that he’d be close to the exit if the rain should come down. Well, we had barely gone inside through a side entrance when a massive clap of thunder announced the downpour. In seconds, people rushed in from outside taking shelter in the huge pavilion of the temple. Roads become gold-brown rivers almost instantly, as the rain bucketed down in sheets. A breeze blew across the ground, wafting fine droplets in through the open sides of the temple, making the white marble quite slippery. “Rain.” Gestures of fingers pointed up to the sky. “Good.” Smiles. Simple exchanges with locals drawing out more smiles and a few hesitant “Hellos”, as J and I watched the water teeming down. Most seemed very happy and excited by the rain. After a long dry season, the drenching must have been very welcome. One-hundred and eight feet long, resplendent in gold robes and jewelled crown, reclining Buddha rested His head on a ‘pillow’ of bejewelled golden boxes. His little finger alone is about ten feet long. His feet struck me as unusual; instead of being parallel with heals together, His were akimbo, with one almost flat and the other resting on top of it. I’d not seen another Buddha like it. A dozen steps down from Buddha’s platform was a large open hall, lined with vendors and stalls. Ladies lounged around chatting while children ran around making their own entertainment after being forced inside by the downpour. We walked down to the end, which was the main entrance to the temple, guarded by clitches like so many temples are. A few children said giggly hellos as we walked, shyly returning to their mothers when we greeted them back. The rain eased as the storm passed through. Seeing us return to the entrance, Kyaw bought the car right up to the doorway so we didn’t have to walk through the muddy puddles. “Rain, going. Not much”, he chuckled as we set of down the watery roads. Not far along, another enormous reclining Buddha, Naung Daw Gyi Mya Tha Lyaung, lay in what seemed to be an open field. “This one new”, Kyaw told us as he drive up beside it. I jumped out and took a few quick shots. Remarkably, overhead, the sky was now blue again, and the sun blazed down quickly drying any trace of the rain. We turned back onto a paved road where we could see a massive gold stupa in the distance. Shwe Maw Daw pagoda is even bigger than Shwe Dagon in Yangon. Lined with shops selling posters, Buddhas and a multitude of religious paraphernalia, a grand boulevard lead pilgrims to the multi-tiered entrance gate. Stepping out of the car at a side entrance, we were immediately struck by the intense sun. If it had rained here at this temple, there sure weren’t any signs of it. Blindingly bright under the midday sun, the immense golden stupa was very similar to the great temple in Yangon, but deserted in comparison. A sign near the entrance proudly boasted at 376 feet, it was the tallest stupa in not only Myanmar, but south east Asia. Many little shrines were dotted around its base, along with the traditional astrological stations. Little miniature stupas clustered around the base, with golden tablets forming a low fence. Under the fierce sun, the white marble tiles were very warm under foot, but when you stepped onto concrete floor, it felt like walking on bare coals of fire. Canvas rugs had been put down around the circumference so other pilgrims didn’t burn their feet. As we walked around to the other side of the massive, carefully trying to avoid burning the soles of our feet off, we found that thunderstorm, stalking us, approaching rapidly from the other side of the stupa. But it was well to the east so no threat this time. 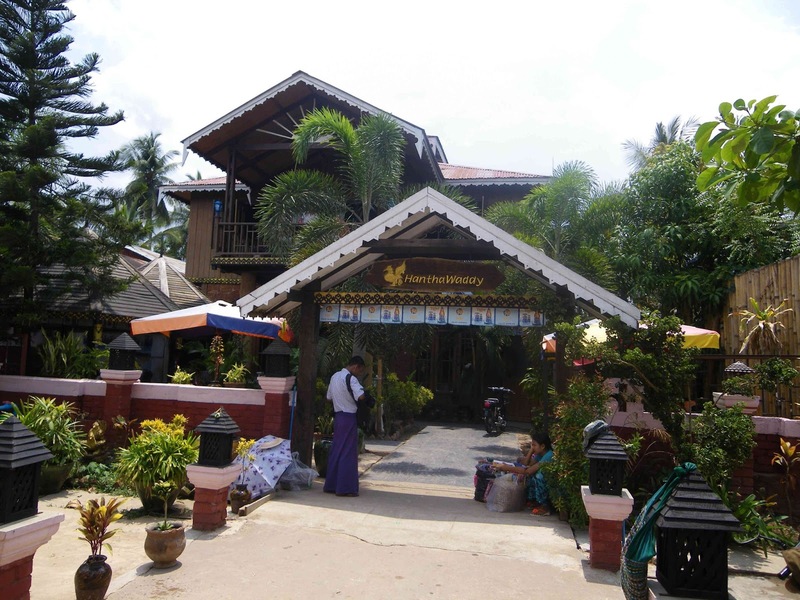 Next on Kyaw’s magical tour of Bago was the recently restored (or rebuilt) Kanbawzathadi Golden Palace. Apart from a small group of locals, we were the only ones there. It’s a large, previously walled, palace complex with two large manors. The main, larger palace, was the Mon king’s office, where he took care of all the stately business in his great audience room to hear the local people’s business and make rulings over domestic issues. Along each side of the building stood two huge halls currently used as a museam of sorts. Ancient teak posts of the original palace were laid out as well as a gilded cart or wagon of the king. Behind the central audience hall connected by a small passageway, the seven-tiered roofed Mya-Nan Pyathat housed the Sihasasna, or great lion throne, supported by many lion sculptures. The other palace was a few hundred metres down the road specifically built for receiving guests perched on a bee throne (Bhamarasana). Behind the throne hall, an enormous dark room provided a bedroom for the king and queen. Surrounding the palace the gardens were in the process of being meticulously manicured. Little wooden bridges and gazebos were set amongst palm trees and young green bushes which in the coming years will surely become a lovely garden oasis for future visitors. Time for lunch. I was ready for an out-of-town, real local meal (hopefully with a vegetarian option). Kyaw took us to a restaurant clearly set up for tourists. “This one has many good food. Noodles. Other one, not so healthy”, he chuckled. OK we smiled back, happy to give anything a go. A few sellers were sitting in the shade of umbrellas motioning to us to buy postcards or floppy hats as we walked in the entrance. 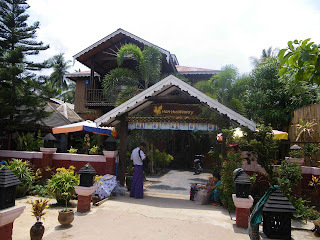 We were welcomed by the friendly staff at the HanthaWaddy restaurant. Another small group were just being served their lunch and it looked and smelled terrific. Plastic covered menus were produced along with cold water followed quickly by lime juice. Ordering curries, we sat back fanning ourselves with the menus and wiped sweat from our faces. Though cool and shady, the day was hot and there was almost no air movement inside. As our lunch was serviced, the other group left. The sleepy sellers at the entrance sprang to life and swarmed the departing party, shoving the goods right in their faces. J and I watched as some bargaining was done, the sellers counting their kyats once they had left. Over our delicious meal, J and I pondered how to escape their fate and slip through the gauntlet without being accosted by the pushy vendors. Turns out, you simply need to stay focused on the exit and not even look sideways at the goods being offered to exit unscathed. Smile, stay friendly, but firm, and swiftly get to the car. Even as I was getting in Kyaw’s car, one older gentleman seller was still pushing his collection of postcards towards me. “How much you pay?” “One thousand for all”. “All Bago.” I guess they may have been a bit disappointed without extracting any sales form us. Heading out of town, Kyaw informed us that it was a good hour or two drive to the town of Kyaikto and onward to the Kinpun base station where the journey to Mount Kyaiktiyo – aka golden Rock - begins. I was keen to see some more of Bago, but given it was well into the afternoon, we had to leave to get up to the rock before nightfall.